In Greater Vancouver, BC, Canada, house prices fell 0.5% in March from February, the eighth month in a row of declines. It was the sharpest eight-month decline since February 2013. After an 18-year housing boom, the downturn has arrived in Vancouver and Toronto, among the formerly hottest housing bubbles in the world. 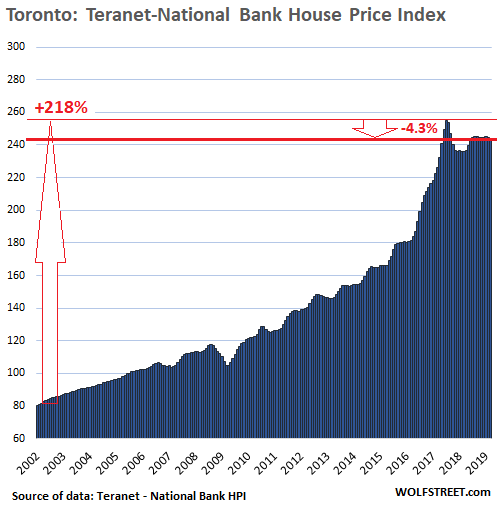 In Greater Vancouver, BC, Canada, house prices fell 0.5% in March from February, the eighth month in a row of declines, according to the Teranet-National Bank House Price Index released this morning. It was the sharpest eight-month decline since February 2013. The index is now down 4.3% from the peak in July 2018. And it's down 2.1% compared to March last year. 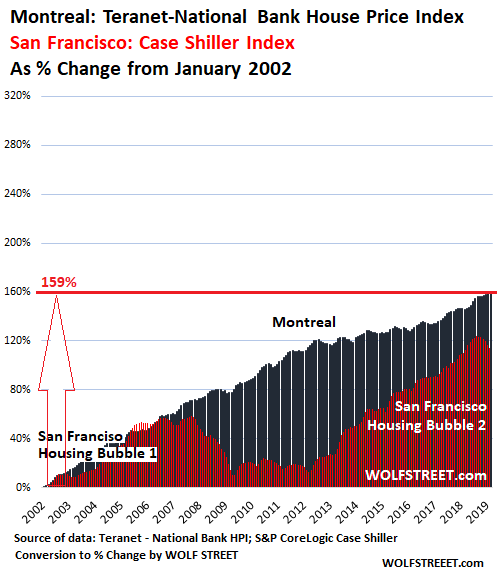 Canada's housing markets barely dipped during the Financial Crisis when US housing markets ran into deep trouble, causing the Mortgage Crisis that begat all kinds of other crises. Canadian homeowners and banks watched the mess from across the border and shook their heads. 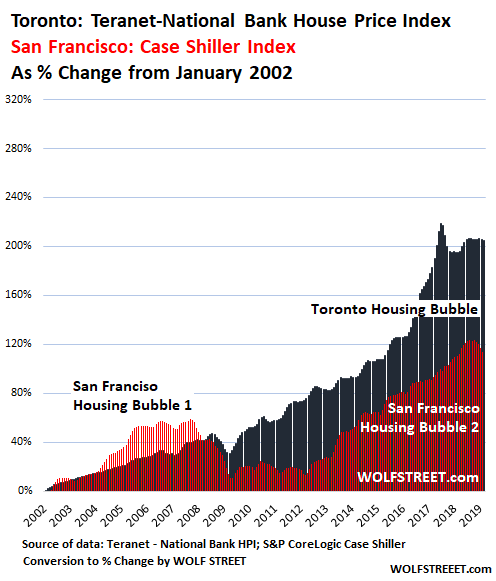 But now, after an 18-year housing boom, the downturn has arrived in Vancouver and Toronto, among the formerly hottest housing bubbles in the world. The Teranet-National Bank House Price Index tracks single-family house prices, based on "sales pairs," similar to the S&P CoreLogic Case Shiller index for US housing markets. It compares the sales price of a house in the current month to the prior sale of the same house years earlier (methodology). Using "sales pairs" eliminates the issues that affect median-price indices. 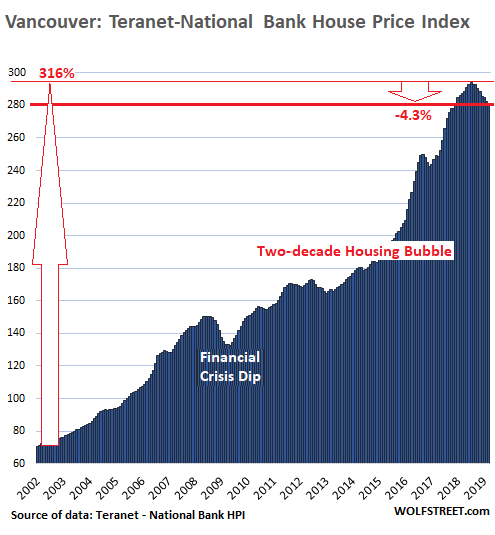 But the median-price data for Vancouver is a lot more disconcerting than the Teranet data. 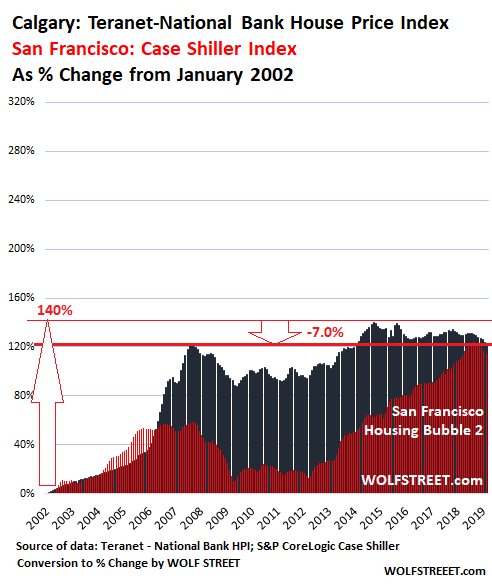 So let's compare how Vancouver's housing bubble stacks up against the legendary but now also deflating housing bubble in San Francisco. 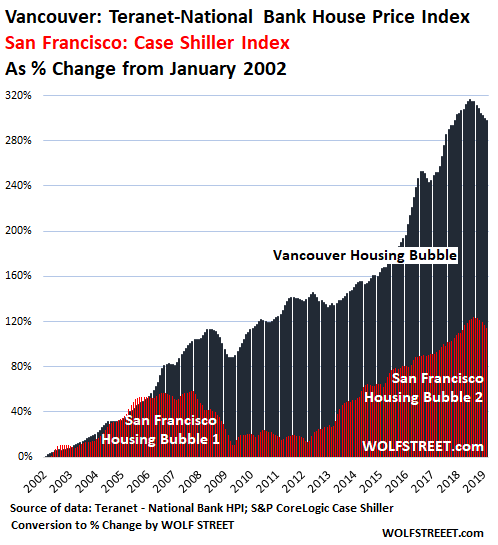 The Teranet-National Bank HPI and the Case Shiller Index are both based on "sales pairs" and are comparable metrics. So I converted the index data of both into "percent change from January 2002." Same data, but denominated in "%-change." Even the individual charts look the same. This allows me to put both indices on the same %-change scale on the same chart. These house price indices that are based on "sales pairs" measure how the price of the same house changes over time - a house that didn't grow in size or opulence. What has changed is the purchasing power of the Canadian dollar with regards to houses in Canada, and the purchasing power of the US dollar with regards to houses in the US. 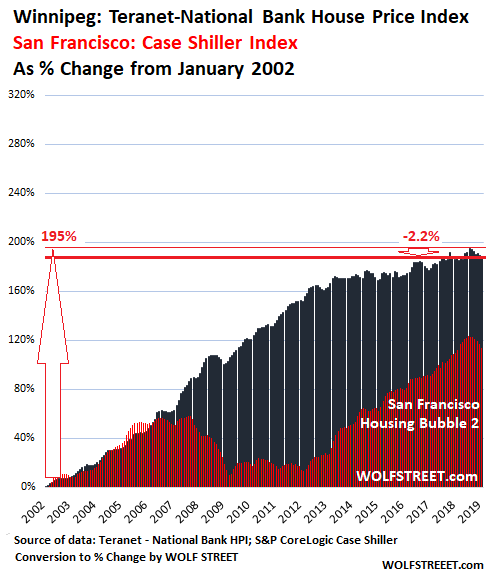 During the bubble era, this purchasing power has dwindled. And now, as prices drop, all it means is that the dollar gains purchasing power with regards to houses. In this manner, the "sales pairs" indices are a measure of house price inflation, which completely spiraled out of control in Canada's hot housing markets.